Find out how these exchanges stack up. Financial markets are critical to the world economy, and the growth of financial exchanges has been impressive in recent years. Companies like CME Group (NASDAQ:CME) and CBOE Global Markets (NYSEMKT:CBOE) have dramatically expanded their initial scopes to go beyond their futures and options origins, taking on a wider range of financial products to try to cash in on rising interest among institutional and retail investors. Even though the bull market in stocks has continued for nearly a decade now, though, the future isn't guaranteed for these two exchange stocks. 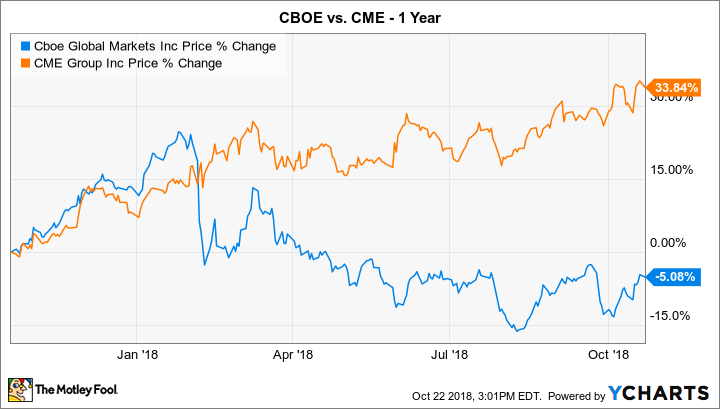 Below, we'll take a closer look at how CME Group and CBOE Global Markets stack up on some key business and financial metrics, with the goal of determining which one would make a smarter addition to investment portfolios right now. CME and CBOE have gone in different directions recently. CME has produced impressive gains, with its stock up nearly 34% since October 2017. However, CBOE has lost ground, falling 5% over the same time period. Initially, a cursory look at simple valuation metrics might lead you to think that CME remains the clear favorite. The stock currently sports a trailing price-to-earnings ratio of just 14, compared to CBOE's trailing multiple of 23. However, recent numbers have been skewed by certain one-time items on the financial books, especially related to tax reform in the U.S. market. When you look at near-term projections for earnings, CBOE's attractive becomes clearer. The stock currently sports a forward earnings multiple of about 22, which is somewhat less than CME's figure of 26. That makes CBOE a better play on valuation, but the difference isn't as huge as you might expect given recent stock performance. Many stocks rely on paying dividends to their shareholders in order to draw investment, but neither of these exchange stocks does a particularly good job in this vein. CME Group's current dividend yield is 1.5%, which is quite a bit lower than the roughly 2% average for the S&P 500. CBOE's yield is even less attractive, weighing in at 1.2%. However, it's important to note that the figures above only reflect regular quarterly dividends. That's all CBOE's shareholders have received for the past several years. But for CME, investors have received additional payments of $2.90 to $3.50 per share each year over the past few years, and that effectively more than doubles its real yield. When you include those special dividend payments, CME earns a decided edge over its industry peer. CME Group and CBOE Global Markets both have plentiful opportunities to benefit from expansion in investing activity around the world, and they've tried to make the most of it. For CME Group, the most recent quarter brought strong growth, with revenue climbing 15% and producing adjusted earnings per share that were higher by more than 40% compared to the year-earlier period. Although a reduction in market volatility during the period led to reduced average trading volume compared to earlier in 2018, CME was able to capitalize on greater trading of higher-priced contracts to boost its overall revenue. With the summer typically slow for trading activity, investors have high expectations that the fall quarter will show a return to better performance. In particular, efforts to expand geographically have paid off well, and if Asia and Europe continue to show outpaced growth, that should contribute to CME Group's overall success. CBOE suffered even more dramatic slowdowns in its growth during its most recent quarter. Revenue was higher by 6%, and the company managed to boost its net income by 22% from the year-earlier period, but the company's key futures trading revenue dropped 13%. A reduction in volatility was more directly responsible for CBOE's lackluster performance, because the company relies heavily on products based on its VIX volatility index to drive overall growth. Fortunately, greater interest in options helped to salvage the quarter for CBOE, and strong performance in European stock market activity and the global foreign exchange markets contributed to the company's decision to increase its dividend by 15%. Both CME Group and CBOE Global Markets have a lot going for them, with solid growth and exposure to expanding markets. CME Group looks like the smarter play right now, as its stock performance and higher dividend outweigh the slight premium on the valuation front. However, as long as conditions in financial markets across the globe remain good, both stocks have plenty of potential to rise from here. Is Cboe Global Markets a Buy?